The leadership of the Peoples Democratic Party (PDP) has finally agreed to hold its national convention in Port Harcourt, Rivers State capital. This was one of the key decisions taken at the party’s National Executive Committee (NEC) meeting held yesterday at the Abuja secretariat of the PDP. Governor Nyesom Wike was said to have to apologized. According to The Nation, an inside source said some party chieftains also apologised on behalf of the Rivers Governor, adding that he was sober and contrite while tendering his apology. 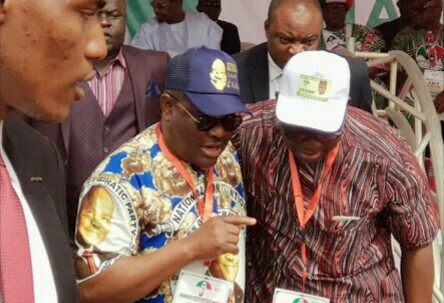 Governor Wike had on Wednesday, gone on air, threatening to “teach the PDP a lesson” if the party failed to hold the convention in Port Harcourt. The governor’s threat was in response to a statement by the chairman of the party’s Board of Trustees (BoT), Senator Walid Jibrin. Jibrin had, at a stakeholders meeting on Monday, dismissed reports that the PDP convention would hold in Port Harcourt, saying that the party hadn’t taken a decision on the venue. Speaking with journalists, shortly after the meeting, Senate President, Bukola Saraki, confirmed that the issue of venue was amicably resolved by all stakeholders. Saraki said, “We all agreed to hold it in Port Harcourt. Some of the issues that we are having before, which were reported in the newspapers were discussed. “Everybody decided that we should stay with the party. Where tempers were flared, people apologised and everybody felt that yes, there was a commitment to assure everybody that there will be free and fair primaries. So today has been a very good day”. All the aspirants were said to have collectively assured the meeting that their initial fears over the Port Harcourt venue for the convention had been allayed by the leadership of the party. They reportedly reposed confidence in the ability of the leadership of the party and the convention committee to conduct a seamless exercise. However, the convention, where the party’s presidential candidate will be elected, has been shifted from October 5-6 to October 6-7. No fewer than 3,619 delegates across the country are expected to vote to elect the party’s presidential flag bearer at the convention. Other resolutions arrived at included a written commitment of all the 12 presidential aspirants to a bond accepting the outcome of the primary election and to join forces with the eventual winner to form a united front.